In her private and professional life, Mafikizolo’s Nhlanhla Nciza is back on top of her game. 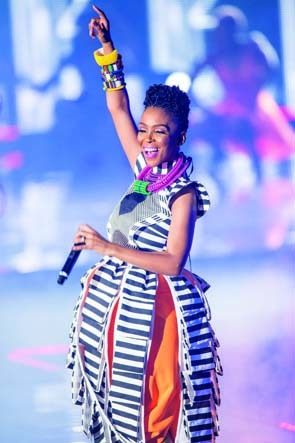 Songbird Nhlanhla Nciza of Mafikizolo is living proof that, at the age of 36, you can have it all – and at the same time too! Not only is she a top musician who’s known internationally, she’s also a doting mother, wife and sought-after fashion designer. Nhlanhla and Theo Kgosinkwe are the duo who make up Afro-pop sensation Mafikizolo, one of the most acclaimed and celebrated groups in Africa. Yet, in spite of her success, she has no airs and graces. She’s unfazed by it all and, instead, upholds her mother’s teaching of humility. “Growing up in Daveyton, my mother instilled the principle of respect in my siblings and myself. She told us to be humble and that when we give respect, it always comes back. That is how I live my life,” she explains. Her humility is surprising, given that we live in an age where even just a small trending wave on social media can give celebrities and socialites huge egos. “I do unto others as I would like them to do unto me,” Nhlanhla says.